The hull of the Michigan is finally complete! Unfortunately, it took two tries... the first time around, I had some leakage in the masking and I found that I didn't bring the red portion of the hull up far enough and there was lots of uneven areas where the two colors met. I ended having to completely repaint the red, reapply the masking tape, making sure to burnish the edge down, and fixed all of the black. 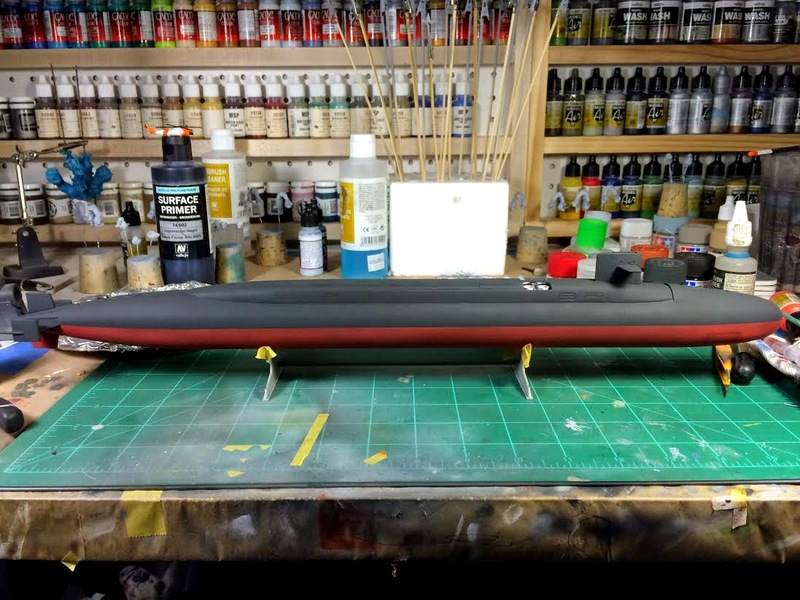 I found that the choice of NATO Black was perfect for the top half of the boat; it gives the look of being realistically "black" but not full-on deep black, which would look funny at this scale. After a color test, I ended up using pure Rubber Black for the no-skid surface on the top of the boat. It turned out even better than I expected and is really subtle under normal lighting. The screw was painted with an undercoat of VMA Burnt Umber and then VMC Brass. The communication masts and periscope for the sail are drying after being painted with a mix of Ocean Gray 2 (XF-82) and Flat White (XF-2). The end result for the color is a pretty close match to haze gray, the color of surface ships. The color call-outs in the instructions call for the masts is light gull grey but I think the haze grey color I used looks nice. After they dry, I'll paint the black parts and the camouflage and attach them to the sail. 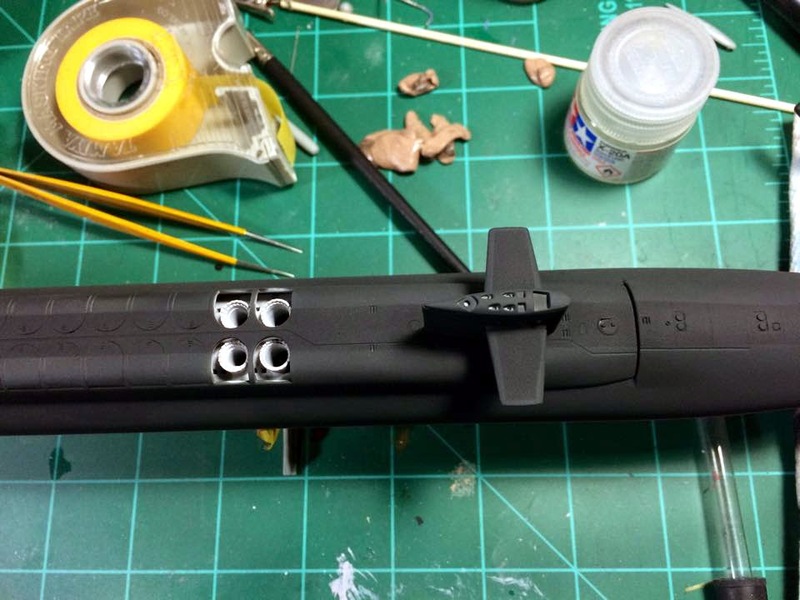 The only thing left is to paint the black on the exterior of the missile hatches and add the decals (luckily, there are very few of them! ).